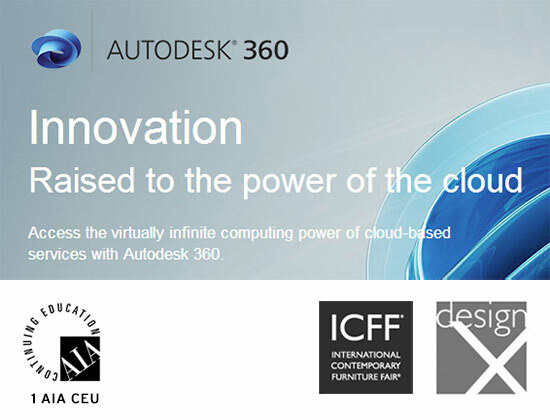 Take advantage of a valuable course at the inaugural DesignX, hosted by the International Contemporary Furniture Fair, and learn about Autodesk 360. Discover how the program takes software capabilities beyond the desktop and allows users to access information anywhere, anytime, and on several platforms. The comprehensive cloud-based design structure offers tools and services that simplify work and has the ability to scale up or down to meet business requirements. Anyone interested in learning about cloud-based design tools and services are encouraged to participate in the workshop on Monday, May 20 from 2:30 to 3:30 PM. Reserve your space here and check out other workshops online. This course offers 1 AIA CEU and is taught by Roger Liucci. Drawing on the idea of fractal geometries, the ceiling’s shapes are the same whether observed from near or far. As the viewer’s distance from the shape increases, “the visual understanding of the form multiplies with the same detail, thus being non-differentiable,” explained Bluarch principal Antonio Di Oronzo. Using Rhino and Autodesk 3ds Max, Bluarch created every layer of the ceiling with simple 6-inch cubes as its basic unit. The design files were handed off to Brooklyn-based fabricator Interiors Palace, who manufactured the cubes with ½-inch-square poplar members. Pieces were preassembled with small metal fasteners into larger sections for installation. Though composed of cubes, the pieces take on a softer form when viewed as a whole. From a functional standpoint, the cloud also softens the space by absorbing sound and providing a surface across which integrated lighting can play. Recessed light fixtures with 60-degree MR 16 RGB LED bulbs fitted with DMX controllers are installed in the ceiling above the cloud, creating points of color and shadow throughout the dining room. 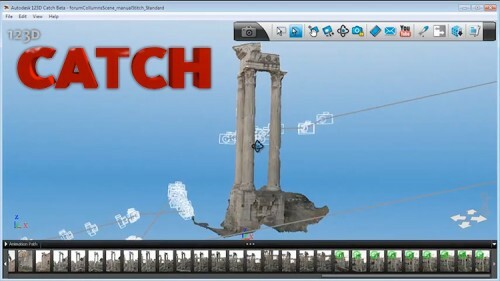 Imagine snapping away at a favorite building, fountain, or desktop tchotchke, then uploading your photos to that super-computer in the sky we call the cloud, and after a just few short minutes being presented with a detailed three-dimensional digital model. That future, it appears, is finally here. Core 77 tipped us off that a new product by Autodesk called 123D Catch performs that basic photo-to-3D-model conversion, and the best part (if you're running a PC) is that you can try out the beta version for free. We're on Macs here at The Architect's Newspaper HQ so we haven't had a chance to test drive the software ourselves, but if it's anything like Autodesk's slick video demonstration (after the jump), we'll be sending our photo archive cloud-side soon!